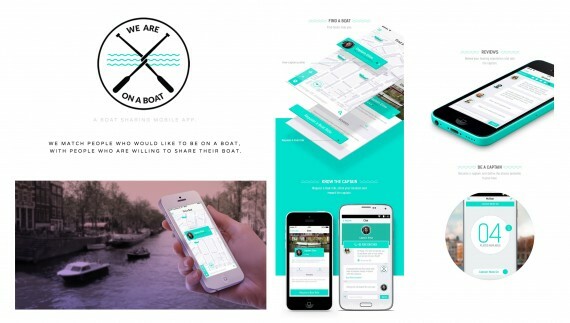 “We are on a boat” is a boat sharing mobile app. We match people who would like to be on a boat, with people who are willing to share their boat. It’s a great opportunity to meet new people, and see the city in a different way. We aspire to create a community of truly Boating enthusiasts. We believe that boating could be experienced by everybody. This app allows people who have a boat to make it available to anyone wishing to enjoy a boat ride. In return, the captains ask for some rewards, such as a snack, drinks or some contribution to the boat fuel.They choose. Making this boat ride pleasant for both. It all started in Amsterdam, but this app is being used all over the world, with almost 4000 app downloads from 60 different countries. Just in the first summer of launch. And we already saw boats being shared in Amsterdam, Denmark, Italy,Toronto, U.S., New Zealand, and counting.. In resume, we inspired a new positive behaviour. Instead of “showing off” their boats people are simply sharing. And not in exchange of money. They are sharing their boats and be rewarding with new friends who bring drinks and snacks on board. An authentic human relation.